Download and print our free alphabet dictionary chart and start practicing your fingerspelling! Feel free to make copies and distribute to anyone who are interested in learning American Sign Language! Note: The file requires Adobe PDF Reader. American Sign Language, most commonly known as ASL, is a non-verbal language that deaf and hard of hearing individuals use to communicate effectively with the use of their hands and facial expressions. 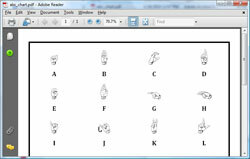 ASL is relatively easy to learn. Like any spoken language, ASL is a language with it's own unique rules of grammar and syntax. To learn enough signs for basic communication and to sign with fluidity, it will take practice. To begin, you can use online resources such as ASLSearch.com to learn individual signs. The videos will help you practice your signing ability as well as reception skills. Being able to read signs is important in conversing with deaf and hard of hearing individuals. To expand on learning ASL, you will benefit by attending ASL classes and/or courses. Sign language classes can be found at community colleges, universities, libraries, churches, and organizations/clubs of the deaf. Seek out opportunities to expand your knowledge of ASL by practicing signs with other people who are deaf or hard of hearing. American Sign Language is not an universal language; each country has it's own sign language, and regions have dialects, much like many other languages that are spoken all over the world. Even if you travel to another state of our country, you will notice words are signed slightly differently. It is known as "regional" signs and you can think of them as an "accent". It does not mean that people in your state are signing incorrectly. While learning ASL, remember that speed is not crucial in ASL. It's more important to sign clearly, even if you have to do it at a slower pace. When people often ask you to repeat yourself, it's a sign that you should slow down and sign clearly as possible. The more opportunities you have conversing with deaf or hard of hearing individuals, the more experience and knowledge you gain. Learning American Sign Language takes time, patience, practice and HAVE FUN!